How to talk your friends and family into seeing "Senna"
The "Senna" documentary arrives in the United States in July, and a few hundred people got to see it last night. Here's how to talk your friends and family into seeing it in theaters. Step 1: Don't call it a documentary. Saying you want to hit up a documentary about a race car driver — even the greatest race car driver ever — could be a hard sell to those unfamiliar with the legend of Ayrton Senna, especially with a blockbuster-stuffed mulitplex down the street. Just leave off the documentary part; the movie doesn't have a narrator or talking heads or Ken Burns-style panning in a second of its 94-minute running time. Step 2: Leave them in the dark. Viewers who come to the movie with a full head of Formula One history will savor it — from the in-car footage of the Brazilian careening around Monaco with the whine of the Honda engine in his ears to the wheel-on-wheel contests with Alain Prost. But director Asif Kapadia has sculpted the film to appeal to the broadest audience possible, giving Senna, Prost and many others enough screen time for viewers to glimpse their humanity. 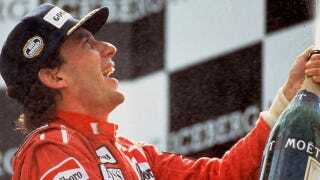 Even if you know how the story ends, "Senna" will move you, to the last words on the screen. Step 3: Think of it as an appetizer. Several viewers at the screening asked tough questions of two producers afterwards. While all offered praise for the film, many had concerns about what was left out: nothing from Senna's masterful Donington Park race, or from Michael Schumacher, or Damon Hill. Producer and writer Manish Pandey offered answers to each, the most relevant being that the filmmakers had access to somewhere between 3,000 and 5,000 hours of footage. Some of it, like Donington Park, didn't work on a movie screen, while other moments were cut to keep the film moving and engaging. For the true fan, there will be a 2-hour, 40 minute version that answers many of those questions, and once people sit down to watch it, "Senna" does a masterful job of creating new admirers of Ayrton Senna.